The DroneGuard series features a patent-pending system of compartments and flexible, removable dividers to manage all parts of a complete quadcopter kit. InterDrone -- Lowepro, the leading maker of photography carrying solutions, has announced the DroneGuard™ series, a three-piece collection of cases designed by and for professional and enthusiast quadcopter pilots. Combining organization, portability, customization and protection with a modular design, Lowepro's DroneGuard series is trusted to take drone photography and videography above and beyond with a tighter, more customizable fit than other quadcopter drone storage solutions on the market. The DroneGuard series features a patent-pending system of compartments and flexible, removable dividers to manage all parts of a complete quadcopter kit, going beyond the "pick-and-pluck" systems that are currently available to keep everything neat, secure and organized. "We first developed the DroneGuard Kit to give photographers and videographers a highly organized and customizable solution that can be used with the bags they already own or by itself," said Tim Grimmer, vice president of brand and product at Lowepro. "Now we're building on the series with two flexible cases with backpack straps, giving quadcopter pilots additional protective options for dedicated drone storage and transport." DroneGuard CS 300 and DroneGuard CS 400, the two new cases in the series, are constructed of tough 600 denier polyester and leverage Lowepro's FormShell™ technology for superior impact protection without added bulk or weight. Each lightly padded case includes conveniently removable backpack straps that can be used for trekking to flying locations, or packed away for streamlined travel and storage. The DroneGuard CS 300 is designed to hold a Parrot Bebop™ or similar drone, while the DroneGuard CS 400 can carry a DJI Phantom 1™, DJI Phantom 2™, DJI Phantom 3™, 3DR Solo™ or other similarly sized quadcopter. Both include dedicated space and organization for accessories such as blades, props, mounts, cables and batteries. Initially introduced for online purchase in the United States and Canada this spring, the DroneGuard Kit is now available worldwide. 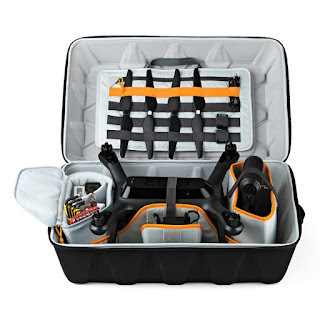 Created to complement the X-shape of many popular drones, such as the DJI Phantom 1, the DJI Phantom 2, the DJI Phantom 3 and other similar quadcopters, the DroneGuard Kit offers a lightweight system to easily store and carry all parts of a complete kit. An ultra-portable tray with grab handles, built with a rigid, durable base and honeycomb interior, provides a foundation for the kit and doubles as a work surface, while retention straps offer security. Modular components include a battery box with adjustable dividers, drone sidewalls with slash pockets and a remote/transmitter divider, trusted to keep all equipment safe, organized and within easy reach when storing, transporting or on location. The DroneGuard CS 300 (US MSRP $129.95), DroneGuard CS 400 (US MSRP $149.95), and DroneGuard Kit (US MSRP $99.95) are now available for purchase at select in-store and online retailers as well as http://www.lowepro.com. For further information about the DroneGuard series, please visit http://store.lowepro.com/droneguard. For 48 years and counting, Lowepro bags have been traveling the world, earning the loyalty and admiration of the best photographers, and setting the industry standard for innovative functionality and remarkable protection. Spanning three collections – professional, outdoor and urban – Lowepro designs and develops protective carrying solutions for specific activities and environments. Wherever your passions and pursuits take you, chances are you'll find us there. To learn more, please visit http://www.lowepro.com. 0 comments on "Lowepro Launches Protective and Customizable Drone Carrying Series"